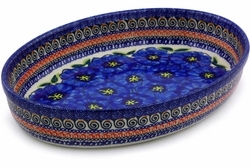 As always with Polish Pottery, this stoneware Baking Dish goes from the oven directly to the table keeping your food hot and beautiful! Your table will never look better! This Polish Pottery stoneware baker is sturdy enough to stand up to daily use by the family. For best results avoid sharp temperature swings: cold to hot or vice versa. Size: 12 1/4" x 8 3/4" x 2 1/4"